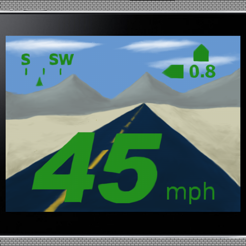 Navi HUD is a navigation tool that supports all means of transportation (car, walking, bike, plane, train etc.) and combines the functionality of a navigation aid with the usefulness of a head up display (HUD). It displays speed and compass direction, and points towards your destination if one is selected. 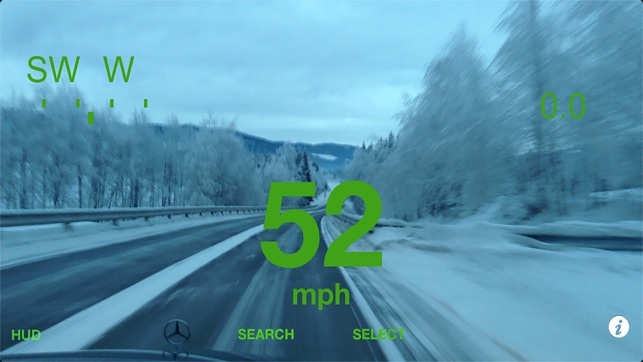 The tool supports both camera mode showing the information directly on screen, and HUD mode for projection onto a car windscreen. The destination is shown with distance and direction, which allows the tool to be used with any mode of transportation (car, walking, biking, bus, taxi etc.) as it is not tied to the road network as most navigation tools. This makes Navi HUD also a a very useful tool for hiking, biking and general navigation around unfamiliar areas. Navi HUD allows selecting a destination either by searching, clicking on the map, directly entering coordinates or selecting the current position. The latter is very useful for for finding your way back to e.g. your car in a large carpark, or your hotel in an unfamiliar city. Multiple destinations can be defined, and it is quick and easy to switch between them. Destinations can be given a user defined name to simplify selection. Have you ever looked at a BMW 7 series and thought it would be nice if your 1987 Toyota Corolla also had a head-up-display? Or do you own a bike, and find it unfair that only cars and fighter planes come with head-up-displays? 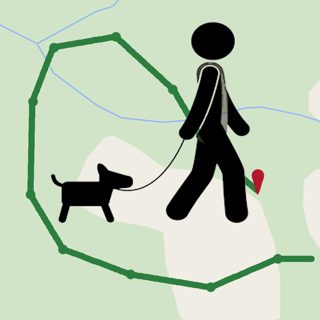 Maybe you want a simple way to find your way back to the car in large car-parks or when you are out hiking, or your way back to the hotel when you are traveling to unfamiliar cities? * G-meter displaying cornering and breaking/acceleration forces. 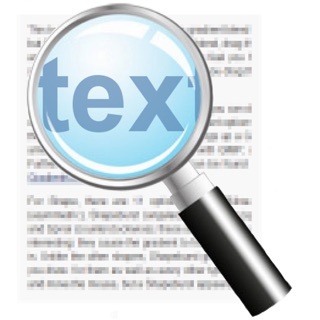 * Search for destinations using text string search. Visualize the search result on a map, and select one or multiple destinations from the list. 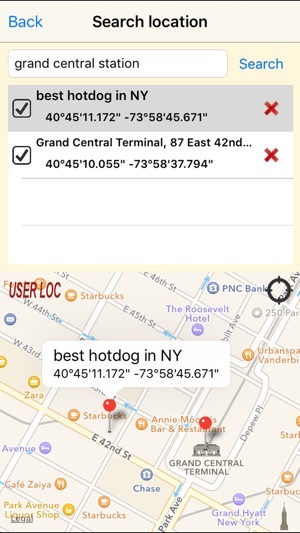 * Place a user defined destination location by tapping directly on the map. * Delete the destination (remove it from the list) when it is no longer relevant. * Map usage requires internet access, and Navi HUD will warn if carrier network is used (to avoid large roaming costs). This warning can be temporarily or permanently turned off. * Camera can be turned off to save battery power. 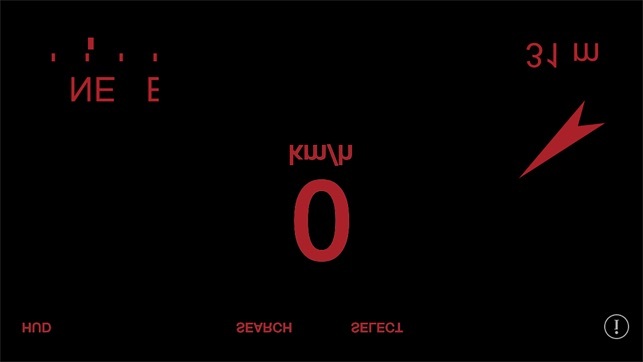 * Separate Head-up display (HUD) mode (mirrored) for viewing the reflection of Navi HUD in a car windscreen. * All settings are permanently stored, and is reloaded at restart. Up to 15 locations are remembered (the 15 most recent). * Navi HUD supports coordinates in both degree, minute, second and decimal degrees with optional N,S,E,W specification. * Manually adjust the screen brightness in app to get best visual result. HUD mode may require a brighter screen than normal mode to get good reflection. 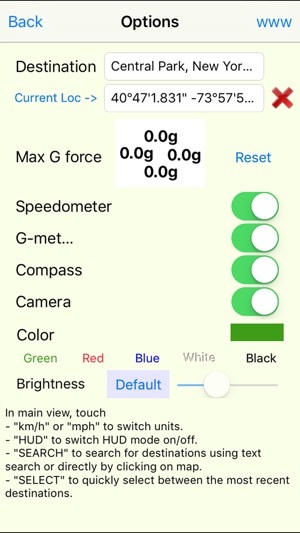 * Easy switch betwen US (miles, feet, mph) and metric (meters, km/h) units for speed and distance. * Note: The tool turns off screen lock, so it must be manually closed to avoid draining the battery when not in use. For support and more information on use please refer to http://daeco.no/iosapps/navihud. - Some bug fixes and improvements, including a bug that caused some user defined positions to get wrong coordinates. Can nor input destination by address. Need to use geo coordinates. Too difficult to input.